Things are looking good for the New York Giants this year! The Source sat down with Mario Manningham, who’s returning to the Giants, to chat about football, fatherhood, and more. 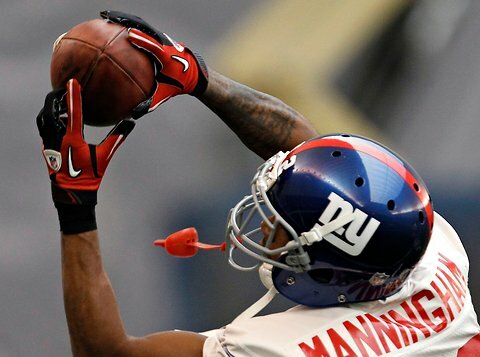 Manningham was with Giants from 2008-2011, before heading to play two seasons with the 49’ers. “It was time to come home,” he said of the move back to the Beast Coast, home to some of Manningham’s greatest career highlights. While with the Giants, “Super” Mario was one of the team’s most productive receivers; he’s also hailed as a Super Bowl hero. His drive for greatness, instilled in him by his mother as a young child, served him well when he made a game changing play during Super Bowl XVLI, catching a 38 yard reception that set off the Giant’s game winning drive. leading them to victory. Manningham caught a pass from Eli Manning, right on the Patriot’s sideline, somehow managing to stay in bounds. Pats coach Bill Bellichek challenged the call, but it was upheld. “Being out west was cool; we had our ups and our downs. Every organization is different. The 49’ers coaching staff was cool and so were the players. There were a couple players I knew from back home in Ohio; we played together since we were little. Brandon Jacobs came out there with me, so it made the transition easy. I will say this though: That was the best weather I’ve experienced in my life. I loved waking up in the morning to walk outside and get the mail,” he laughed. Manningham isn’t just going hard for his team; he’s also putting on for his Ohio hometown, where he hosts a camp for the kids every year without fail. The camp, held in Warren, Ohio, is one of Mario’s favorite times of the year. “On the third day, I’ll put together a little concert for them and take them bowling. They can go to church with me on Sunday, too. Me and three hundred kids! I’m also gonna have to keep an eye on Mama Manningham, because she’s really old school…a few years ago, a few kids got there late, and they came shirtless. My mom told them they were too late, because we’d all ready started. I’m like, ‘Ma, it’s okay!’ I took the shirt off my back and gave my shirt to one of the kids; I had the other staff do the same thing for the other two. I wanted them to participate. I hate to see kids struggle. These are the best days of your life. All you have to do is go to school and get good grades…and just stay out of trouble,” the football star relays. He realizes, however, that for some kids, that’s easier said than done. Mario’s hustle has certainly paid off, but a lot of it has to do with his “old school” upbringing and the queen(s) in his life; primarily his mother, who encouraged him to develop his talents. As a child, Mario had a natural affinity (and ability) for sports. His first love was basketball. Besides surprising her son with pizza and basketballs, Mama Manningham made sure he put work in on the court and on the field, just as Mario does with his son. “I do the same thing with my son that my mom did with me. Lil Mario will be outside playing and I’m like ‘C’mon man, you gotta hit three shots before you get in the house. Come on.’ ‘Cause I remember back in the day in school and the coach would tell us ‘Come on, hit these free throws and you guys don’t have to run today.’ Man, what?! I’d be hitting free throws like nothing! That’s thanks to my mom, though. She used to make me go to the basketball court before my games. She’d sit there and watch me. I used to fuss a little bit, I’d be like ‘Maaaaaaaaan, I just came from there!’ I’d be the only little kid at the community court. My friends would even ask ‘Why your mama always got you at the basketball court?’ and my answer was ‘So I can be good!’ My mom, God bless her, she guided me a lot. And I got my speed on the field learning to run from my mom. She used to run track and she was probably the only parent in the hood who could actually catch her child!” he laughed, reminiscing. His mother wasn’t the only strong influence in his life. Like so many other millennials, Mario has a strong relationship with his grandparents, whom he loves dearly. He’s even teamed up with the American Heart Association to spread the message of heart health on behalf of his late grandfather. “As for my grandmother,” he continued, “She had breast cancer and she is a survivor. She goes to the Relay for Life and she cracks on me because I can’t keep up with her. I can’t just sit there and walk, my attention span is horrible for walking. I’m in the tent. Her and my mom stay clowning me for that,” he chuckled. Mario says he also plans to work with organizations that benefit breast cancer patients in the future as well. Having been blessed with the extremely strong support network his family afforded him, Mario realizes that having positive guidance as a youth makes all the difference. “But it’s also important for kids to see what not to do,” he mentioned. Keep an eye out for Mario on and off the field this season, as he helps lead the Giants to victory and does his part to save the world–one heart and one youth at a time–while he’s at it. “Super” Mario, for real. Turn down for what? !